Do you want to add some color for your bed or living space? Now, Your life will be changed. KEVIN TEXTILE brings you the highest in quality and durability decor sequin cushion covers. Material: Handmade glitter sparking fabric treated to be supple and long lasting. Its anti-static properties will prevent those nasty static shocks. Visually stunning. Functionality and Aesthetics: Treat yourself to a bold design by Kevin Textile. These sparking covers will add that special pizzazz to any room. Designed to be reflective to bring out the sparkle and shine on your couch, loveseat or bed. Perfect for your home, office, bar and during those special holidays and family gatherings. Washing Guide: Turn it inside out and wash it by hand. Swish it through warm soapy water, rinse and press between towels to remove excess water. Then lay flat to dry. 100% Satisfaction Guarantee: We strive to provide the best products at the best price possible. If you are not 100% satisfied with our product, please return it for a full refund. No questions asked. Due to the delicate nature of the sequins, it's normal for a few to fall off the cover. Please purchase certified products from Kevin Textile, Kevin Textile is a registered brands. Otherwise, we are not responsible for any other brand. 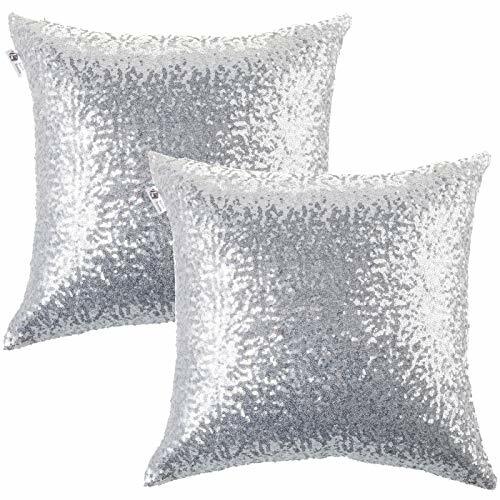 PACKAGE: include 2 pc 18x18 inch (45x45cm) sequin cushion cover. No cushion insert. tailored for 18"x18" insert. DESIGN: Handmade high quality materials including 3mm sequins on one side and soft satin material on the other. Hidden zipper design with quality stitching.